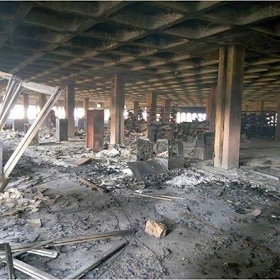 There was a serious fire incident at the Library Complex, Naraguta Campus, University of Jos on Saturday 8th October. It affected the Main Library in the Complex, the Faculty of Social Sciences and some Departments in the Faculty of Management Sciences. Registrar, Monday M. Danjem has now issued a statement announcing that Senate of the University of Jos has approved the resumption of the postponed First Semester Examinations for the 2015/2016 Session. "All Students whose Faculties were affected by the fire incident are advised to liaise with their respective Heads of Department who will direct them appropriately on the Halls where they are expected to write their Examinations." "All such affected Students are also to please note that all First Semester 2015/2016 Session Examinations earlier written but which Answer Scripts were burnt during the inferno, will now be rescheduled to a later date to be communicated to them by their respective Heads of Department."